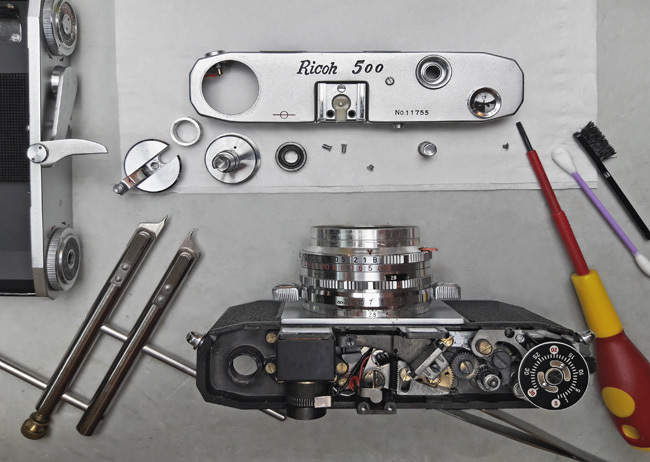 The Ricoh 500 is a completely manual rangefinder camera. 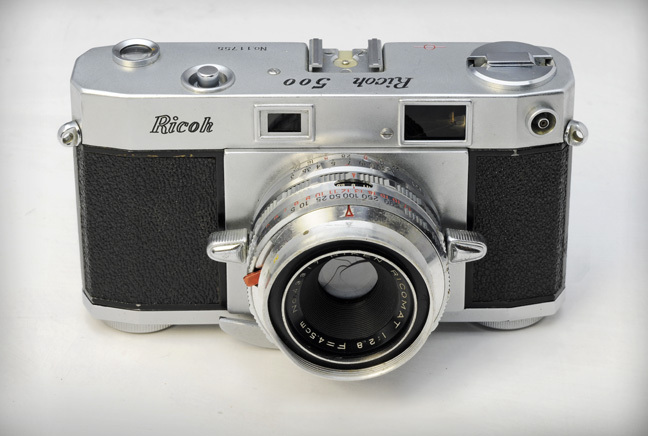 It even lacks a light meter and consequently does not require a battery. The Seikosha-MXL shutter is built into the lens and the film advance / shutter cocking lever is on the bottom of the camera. Thus, the top of the camera has a simple layout and it is easy to remove the top cover as we will see later. Screw off the film rewind knob. To do this open the camera back, put a suitable tool in between the prongs of the rewind shaft to prevent it from rotating, grab the crank and turn the rewind knob counter clockwise. The rest of the film rewind assembly also has to be removed. Two tiny holes are revealed under the rewind knob. Use a spanner wrench to unscrew this part. Unscrew the viewfinder eyepiece at the back. One more screw to remove on the side of the camera and we are done. When you remove the top, the shutter release button becomes loose; don't lose it. Some of the optical elements of the viewfinder are now accessible and can be cleaned. I went a step further, because the fungus infection was fairly wide spread. It quickly became obvious to me that the rangefinder arm (B) with the mirror has to come out. But how? The trick is that it is held in place by a metal plate (A) underneath the camera top. 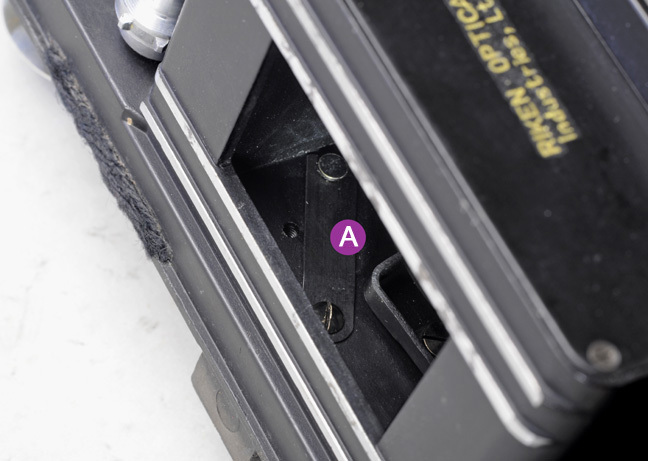 The rangefinder arm's pivot fits into hole (b) and is secured underneath by plate (A) on the other side. To remove that plate one has to undo a screw and that screw is somewhat awkward to access through the film gate. 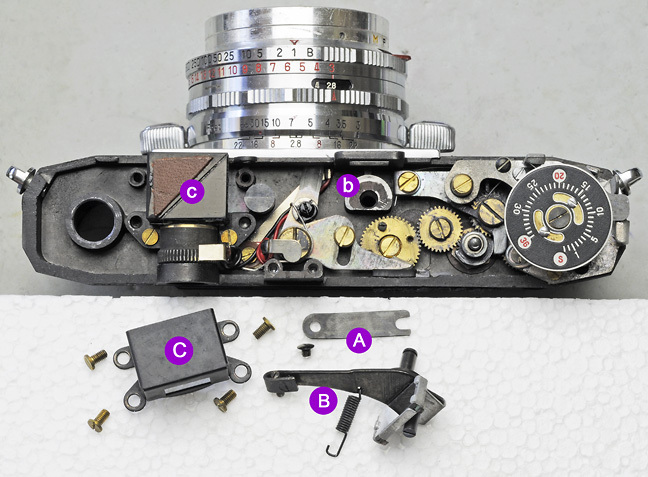 It is only now, that the cover (C) over the viewfinder glass elements (c) can be taken off, because one of the four brass screws was hidden under the rangefinder arm. Needless to say, be very careful when cleaning the glass or the mirror. The mirror is especially delicate. I wrote a few guidelines about this elsewhere on this site.